What requirements should satisfy the solar cooker cookware? Cooking and frying with the parabolic cooker are performed in ordinary commercial metal pots – usually from steel (Inox) and aluminium. Recommendable with thick thermo-bottoms. Also being used are thin-wall enameled steel pots without thermo-bottoms. 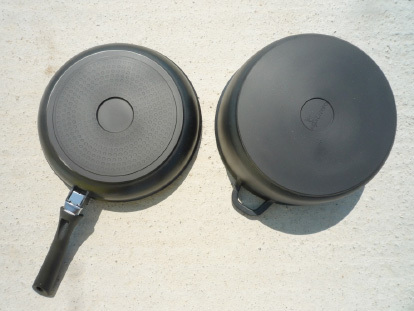 Thin-wall cookware distributes the heat worse than thick-wall, so that could the food be burnt and special attention is needed in this case. When using powerfull (with large diameter) parabolics it is recommendable to use the heavier gauge steel pots; in this case the thinner variety could not only burn and scorch the food, but in case of thin aluminium could even damage the pot. Pots are recommendably painted black outside, in order to absorb more solar energy. Pot handles should be metal. Plastic handles could be damaged by the concentrated heat. Plastic pots are not allowed by the parabolic. The experience of HoSa Solar shows that in parabolics with a diameter of 150 cm and more, successfully could be utilized pots with color other than black – for example blue, red, beige, even white. The cooking process in these cases proceeds more slowly, but is actually feasible. The reason is that in a large diameter aperture falls enough radiant energy, so that even at low absorption levels of the pot, the remaining power is still sufficient to effectively heat and cook the food. Hence, the requirement for black pots is binding only for parabolics of small diameter. The larger the reflector is, the more diverse is the range of colors that can realize successful solar cooking; and the more possible for consumers to utilize the same pots for solar cooking they use for their conventional every day cooking. In a powerful parabolic the usage of non-black pots can be considered as a method to avoid burning of the food and the pot. In the solar oven can be used both thick and thin metal pots. They should also have metal handles. The metal pot is recommended to be darkened both outside and inside. In the solar oven can also be used pots of Pyrex glass.